Here we provide you with cases published in the HIV/TB Drug Resistance & Clinical Management Case Book. These cases have been presented to over 1000 medical doctors in southern Africa at the annual SATuRN Drug Resistance Workshops. The objective is to capacitate doctors, nurses and allied medical staff at all levels of the health system to prevent and manage HIV and TB drug resistance. This 38 year old female patient initiated d4T/3TC/EFV in March 2008. Her baseline CD4 cell count was 108 cells/ul and WHO clinical stage 3. She had a past history of pulmonary TB in 2004. She has been documented to have good adherence, although it was noted that her treatment supporter was her 10-year old daughter. She had a suboptimal initial virological response to ART (VL 1300 copies/ml at six months ) but then exhibited virological suppression at 12 months. Subsequently she had three VL > 5000 copies/ml and a progressive decline in CD4 cell count, despite step-up adherence counselling. Genotypic resistance testing is performed. This patient last three viral loads have been above 5000 copies/ml despite being on therapy. Her CD4 count initially went up when she started her medication only to start a downward trend that went below the baseline count. The high viral load and CD4 trend are suggestive of possible non-adherence to the current drugs she is on. 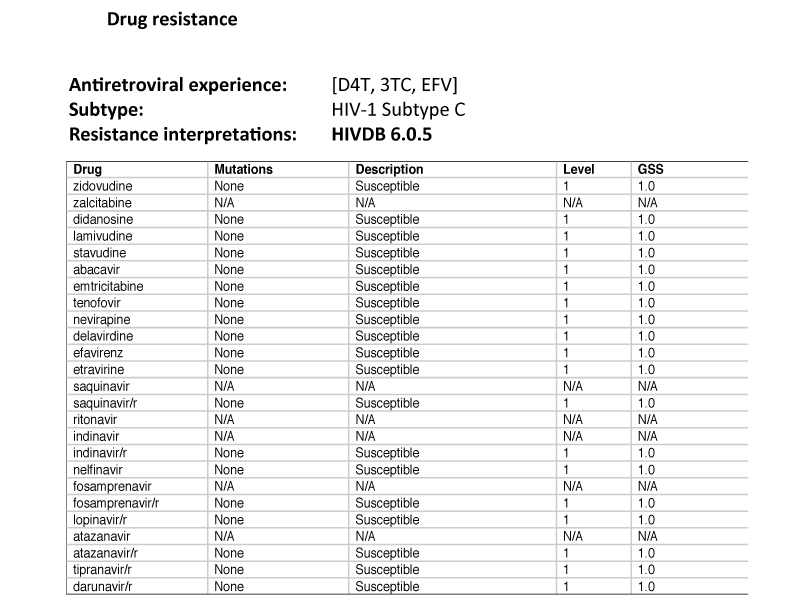 Resistance genotype: No HIV-1 drug resistance mutations where detected from this patient. Her HIV population is still predominantly wild-type. It seems as if this patient is not currently taking any ART and thus had no obvious mutations detected at this time. It is important to remember that she might well be harboring some mutations below the 20% limit of detection and that these might become relevant once she has restarted her ART. It is recommend that she continues/re-starts her original ART, which was d4T, 3TC and EFV - and that the VL is monitored again in 4 to 6 months. If the VL becomes and remains undetectable for at least 6 months, the d4T can be switched to TDF. If the VL does not reach the lower than detectable target by 6 months, resistance testing should be repeated. Intensive adherence support is needed and the use of alternative remedies and social deterrents to adherence should be thoroughly explored. This patient might benefit from an adult treatment supporter. 1. Why can we not be sure there are no resistance mutations? 2. Would it not be better to put her on tenofovir (TDF) now so as to avoid potential toxicities associated with d4T? I. Standard genotypic resistance tests can only detect a resistance mutation if more than 20% of the viral population has developed this mutation. In the absence of drug pressure e.g. if a patient is not taking any ART at the moment, wild type virus will overtake the mutant viral strain since it is generally more fit. The mutant strain will then become a minority strain and will represent less than 20% of the total viral population in the plasma and will hence not be detected by genotypic testing. Once the patient has been taking ART for a few (approximately 6) weeks again, drug pressure will cause the mutant strain to emerge since wild type virus will be suppressed to minority levels. II. Even though there are no resistance mutations detected at this time, we now know that the patient might still be harbouring some mutations. The most common mutations would be M184V giving resistance to 3TC - and any of the NNRTI mutations, such as K103N. If TDF is added to the new regimen in the place of d4T, there is thus a chance that the patient might effectively be on TDF monotherapy. We have learned that TDF has a very low genetic barrier to resistance, especially in subtype C. Resistance will then develop rapidly and by the time that the clinician realises that the patient is failing therapy, she might have developed complete resistance to tenofovir, thereby compromising future treatment options. Although every attempt has been made to ensure that the information in this book is accurate and up-to-date, the authors and publishers accept no responsibility for any loss or damage resulting from use of the information herein. It is the responsibility of the individual clinician or health care worker to abide by national and local guidelines and protocols regarding management of HIV and TB. Information regarding drug indications and dosages should be checked with the national or local formulary, or with the pharmaceutical package insert. None of the authors has declared any competing financial interests with regards to any material discussed within the HIV and TB Drug Resistance and Clinical Management Case Book.